Thanks, is it possible to replicate content to the cloud, rather than to a local file system? Do you mean to store content in cloud statically ? Or to publish instance in cloud ? For case 1, You can create a mount point on local for cloud directly and then give path for mount point in options (Not tested but in theory should work). For case 2 you can use normal replication agent. 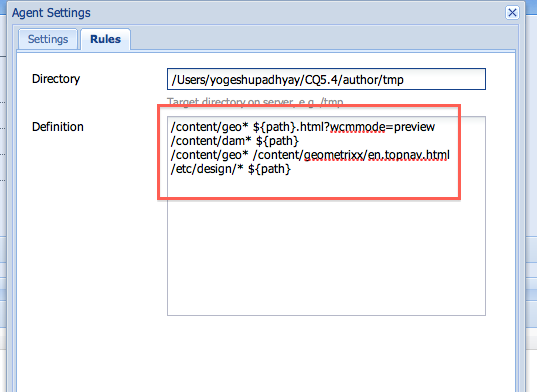 I am getting the html files and dam files in target path but etc/design is not getting . I am surprised that it is even working for DAM files (I guess not all Asset works). This is still work in progress. You might have to create DayCare ticket to enhance this feature. Great post! Thank you! Instead of writing a custom script to activate all content, wouldn't the built-in "activate tree" work as well? Thanks for your feedback. Yes if you want to get all data in file system then you can use tree activation. Custom code is for specific use case. For example in case you want to have static replication logic run as a part of workflow or as a part of custom event. If we create a static agent on publish with triggerModified set, will "activate tree" on the author instance cause the publish instance to create the static files? If you have your static agent set then yes. But also make sure that Publish is listening to on modification event. Because As far as I remember there was a issue where replication on modification fails on publish. Getting below error when we are running workflow to place the file in SFTP using static agent.Any idea? Do you know if there is a way to delete the files created by the static agent when a page gets deactivated? i have a case for having to replicate xml representations of nodes (cq pages and dam-assets) to a filesystem. additionally to create an index of said filesystem. i have created a content-builder/transport-handler pair with which i can set up several agent instances (as required) handlling different subpaths of the repository. all works fine. thing is i do not know how to hook in best the generation of the index... currently i have it at the end of the transport-handler, which is ok for the activation case (since activation transaction only transport one asset at a time and the jcr node already has the final status...) but not for deactivation deletion (since the transaction handles multiple paths and only the "parent" asset has the final status (during transport) while the "children" don't). is there a way to provide ReplicationOptions (making the thing synchronous and providing a ReplicationListener) within the normal framework? 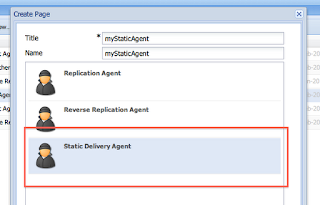 means not by programmatically calling agent.replicate() ? or is there any other hook/event at the end of a given replication (or possibly replication-transaction or possibly general osgi event)? Error during replication com.day.cq.replication.ReplicationException: Test replication not supported by this transport handler. I have a requirement to store all the html pages in a local disk. 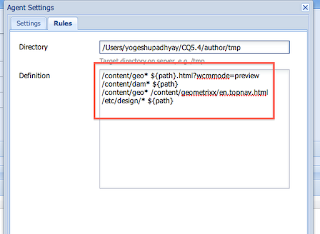 currently i am using a static agent on publisher to do that but i have a enhancement on the the above task to remove all the /content/myproject/english from the paths on the page and replace it with mycompany,com. i have to do it in the html file before i store it on to the disk. Any help is appreciated.